Meet your guide at Battery Park in Lower Manhattan in the morning, and receive access to the reserve line for the ferry ride to the Statue of Liberty. When you arrive, walk the 215 steps to access Lady Liberty’s pedestal for unique views over Manhattan, and learn about the renowned landmark’s construction. Back on the ferry, make the short journey to Ellis Island, the historic immigration center for more than 12 million immigrants to the US from 1892 to 1954. Enter the restored Great Hall of the Ellis Island Immigration Museum, where you have about 2.5 hours of free time to explore the museum’s interactive displays independently. 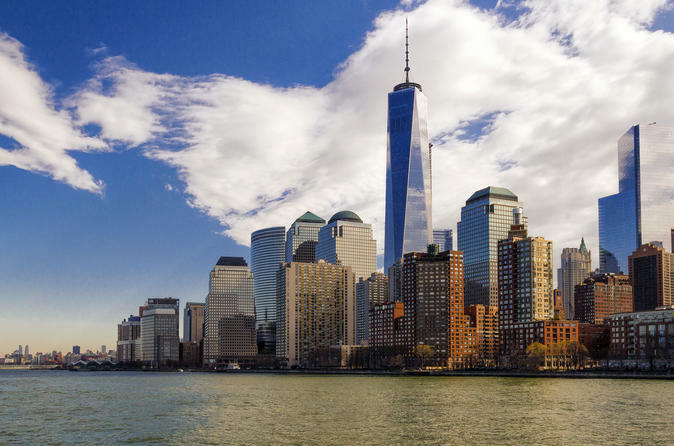 Then return to Lower Manhattan on your own by ferry to grab lunch before meeting back up with your guide at Battery Park (lunch is at your own expense). In the afternoon, walk with your guide to St Paul’s Chapel, where New York City residents gathered to pray, offer support and await news in the immediate aftermath of the 9/11 attacks on the World Trade Center. Inside the church, see hand-drawn cards, personal memorabilia and photographs that still hang. Next, follow your guide to the National September 11 Memorial and stop by its twin reflecting pools, built in the footprints of the former Twin Towers. Visit the Fireman's Memorial; view the exterior of One World Trade Center (aka Freedom Tower); and see the miraculous ‘Survivor Tree,’ a symbol of NYC’s enduring strength. The guided portion of your tour ends here, from where you can make your own way to your final destination, the One World Observatory positioned at the top of One World Trade Center. With a pre-reserved ticket, you won’t wait in line, so say goodbye to your guide and head straight inside. Board a Sky Pod elevator to ascend 102 floors in less than 60 seconds, and watch a brief video that dramatically reveals NYC in three dimensions. On the 100th floor, look out panoramic windows from above 1,250 feet (365 meters), and step into the Sky Portal, a 14-foot-wide (4-meter) disc in the floor that showcases city streets below in live HD. Then experience City Pulse, an interactive ‘concierge’ that shares stories of the city, its landmarks and neighborhoods via state-of-the-art technology. For drinks or a bite, head to the 101st floor to find a bar, cafe and fine dining. You may stay at the observatory for as long as you'd like to soak up the 360-degree views over the Big Apple.